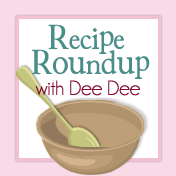 It's time for another round up Blogger's Recipe Roundup. I have some yummy recipes lined up, so I hope you come back each day this week to check them out. 1. Preheat the oven to 350° F. Lightly coat eighteen 2 1/4 inch muffin cups with the cooking spray or insert cupcake liners. Sift the flour and baking powder onto a sheet of wax paper and set aside. In a large bowl, cream the butter with an electric mixer set on medium speed. Gradually add about 1/2 cup of the granulated sugar in small amounts, beating until the mixture is light and fluffy. Add the egg yolks and almond and vanilla extracts and beat until well combined. 2. In a perfectly clean medium-size bowl and with clean beaters, beat the egg whites with the electric mixer set on high until they form soft peaks. Add the remaining granulated sugar in small amounts and beat until the egg whites are stiff and glossy but not dry. 3 Add the flour mixture and milk to the butter mixture. Fold in the coconut and egg whites and spoon the batter into the prepared muffin cups, filling them 2/3 full. 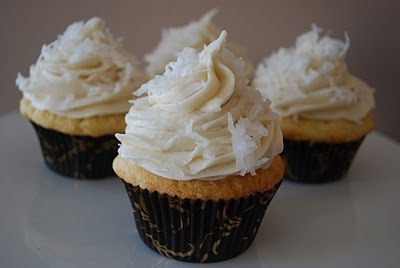 Bake for 20 to 25 minutes or until a toothpick inserted in the center of a cupcake comes out clean. Let cool to room temperature. Using electric mixer, beat butter in large bowl until smooth. Add sugar, 1/3 cup reduced coconut milk, seeds from vanilla bean, and salt. Beat on medium-low speed until blended, scraping down sides of bowl. Increase to medium high and beat until light and fluffy. Using pastry bag fitted with large star tip, pipe frosting onto cooled cupcakes. (Alternatively, top each cupcake with 2 tablespoons frosting. Using small offset spatula, swirl frosting over top of cupcakes, leaving 1/2-inch plain border.) Sprinkle with coconut. DO AHEAD: Can be made 1 day ahead. Store in airtight containers; chill. Bring to room temperature before serving. These look so good. I love coconut! I'm dying! I want those, but just don't have the energy to bake right now....anyone want to make them for me and surprise me! ?